It is not possible to avoid negative thoughts entirely, because our brains are wired that way. However, it is possible to reduce their impact by being mindful. If we are aware we will be able to catch the negative thoughts and let them go. I have written a few techniques that I have personally found useful over the years. Life is not black and white, there is a very large grey area as well. When we are being negative we tend to think things are ‘all or nothing’ and ‘this or that,’ but that just isn’t the case. We either think things are going to be perfect or a disaster, we never see the shades of grey between these two extremes. When we are in a relationship, if we are being overly positive, we think it is going to be perfect. When we are being negative we think it is going to end in total heartache. However, there is a more realistic grey area between these two. If we are thinking realistically, we would see that sometimes the relationship will be fantastic, sometimes just good and other times not so good, just like every other relationship. When you think in black and white terms you are setting yourself up for failure. Be realistic and think about the grey middle ground. When other people make mistakes we tell them it doesn’t matter and it is no problem. Yet, when we make the same mistake we are very harsh and unforgiving. We tell ourselves that we are stupid and we are always making mistakes. This is not only negative, but also destructive. You need to befriend and have compassion for yourself. You have to understand that you are human and so are liable to make mistakes from time to time. When you make a mistake just acknowledge it, learn from it and move on. I would also add that if you know you are feeling negative, be kind to yourself and do not read or watch any news, as this could further irritate your mood. We have to understand that a negative thought is just a negative thought. It only has power if we focus on it. If we blindly follow every negative thought we will never be able to be positive. If you think, ‘I am a stupid person,’ and you believe it, you are going to feel negative. However, if you just see a thought as a thought, you can say to yourself, ‘I am thinking I am a stupid person at the moment.’ There is a big difference between these two thoughts. If we see thoughts as a part of us we are going to follow every stupid thought we have – and let’s face it, we have many. Here is an example of believing thoughts to be real. We think we will not pass our exam and we get fixated on this thought. We tell ourselves that we are not good enough and we cannot remember what we have been taught. The more we follow these thoughts the more they become true. In the end, we totally believe we will fail the exam because we are stupid, and of course this type of negative thinking is just setting ourselves up for failure. We have to understand that not everything we think is true, but we can only do this when we become mindful of our thoughts. Next time you have a negative thought tell yourself, ‘I am not a negative person. 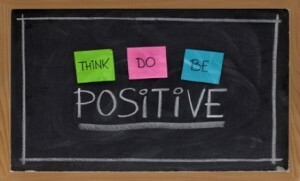 I am a positive person.’ The mind will then start focusing on this thought and not the negative thought you were having. If you recite this affirmation every time you have a negative thought, slowly you will start to believe you are a positive person. You will be planting positive seeds into your mind and this will mean fewer and fewer negative thoughts will arise. 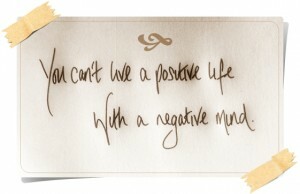 The mind is a creature of habit, so encourage positive thoughts and eliminate negative ones. It is the same with any negativity. We should not accept everything people try to dump on us. If someone is trying to tell you that you are not good at your job, but you know you are, then don’t accept it. Tell yourself that this is just their opinion and it is not your experience. If we do not accept what is being offered, we will not take on other people’s negativity. She is late. She must be seeing someone else. If I was a good parent, I wouldn’t get angry at the kids. I can’t do this, so I must be stupid. My medical tests are not ready. It means I really am very sick. We make up stories all the time and then start to believe them. It is true that life is not always a bowl of cherries, but it doesn’t mean every situation is going to be bad. We have to deal with our experiences as they arise, and not invent a negative scenario, that may or may not happen. Let’s look at an example. You are driving to a business meeting and you take a wrong turn. The negative mind tells itself that you are always doing this, even though you aren’t, and that you will now lose your job, which of course you won’t. However, once we start thinking like this we get agitated and stressed. This leads to more negativity and so the downward spiral begins. Keep your story telling for bedtime, and just respond to an experience as and when it arises. If you are a negative person it is useful to write a list of positive things in your life. This will help disarm your negative thinking. You can then refer to this list when you are feeling negative. You may think that no one loves you, but when you look at your list you see that your parents, family and friends all care for you. You may think that you are useless, but the list tells a different story – you went to a good university and you have a good job. By referring to this positive list regularly you will be creating a natural defense against negativity. You will see that for every negative thought you may have, you will be able to counter them with four or five positive things in your life. We have to be diligent if we wish to stop being carried away by negativity. We are responsible for what we think and so we are the ones that have to eliminate negative thoughts. With practice we will be able to see when we are thinking negative, and we can then implement the appropriate action. 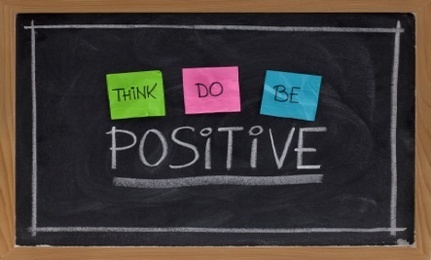 However, this all takes effort on our part, but reducing negativity and promoting positivity is totally doable. I read this post very thoroughly and i really like it. Reading your post I know how to overcome my negative thoughts and to live a positive life. According to Lama Surya Das Our mind is everything when we think positive then we become positive similarly when we are think negative then we become negative. I think we should not think negative about our self but learn to love our self.